Montabert BreakerLub: a unique special lubricant, exclusive to Montabert. Montabert BreakerLub is the result of intense co-operation between the Engineering Departments of Montabert and Anderol Italia-Meyer high tech Lubrication Systems, two well-known worldwide specialists in advanced technology. 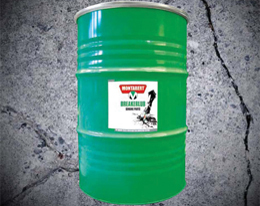 It is totally different from any other breaker grease or oil. It is based on synthetic components, specially selected for their “polar” attraction characteristics which enhances lubricity, metal affinity and lubricating film strength, even in the most adverse operating conditions. The specific additive package and the solid lubricants are carefully selected to obtain top protection of all vital parts. Its exclusive texture and consistency have been defined to fully exploit the technology of the Montabert-designed lubrication system. Its physical characteristics perfectly match the Montabert lubricant supply systems (on-board Greasing Stations and Easy-Lube equipment). Montabert BreakerLub fulfills its promises!